Spring in Albany is all about Tapping Maple Trees and Awaiting the Tulips! Albany, NY – We’ve been busy finishing up the 2014 Visitors Guide since our last press release, and Albany will be bustling with spring soon approaching! It may be freezing now, and even hard to imagine warmer weather, but some of Albany’s well know springtime events are just around the corner! Kick off spring on March 15th at the corner of Quail Street and Central Avenue in Albany for the 64th annual St. Patrick’s Day Parade. This event is a favorite amongst visitors and residents alike, and ushers in the start of warm weather! Another event that is coming up quickly is Maple Weekend- a two weekend event, March 22nd-23rd and 29th-30th, where syrup producers open their doors to people to see how maple syrup is made, and sample the fresh, local product. The weekend is put on by the New York State Maple Producers Association. 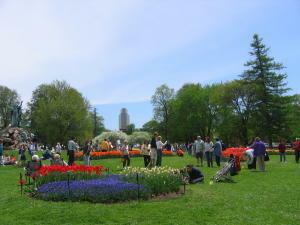 New York State’s capital city will begin preparing for one of the area’s biggest events with the blooming of hundreds of thousands of tulips this Mother’s Day weekend in Albany’s historic Washington Park. The Tulip Festival’s 66th anniversary is on May 10th and 11th, complete with the crowning of the Tulip Queen and the naming of the Mother of the Year! In 1948, Erastus Corning II, the Mayor of Albany declared the Tulip the “official flower of Albany”. Following that, Queen Wilhelmina of the Netherlands honored the Mayor’s request and designated the variety of tulip, known as the “Orange Wonder” to be the tulip of Albany. Tulip Fest was born, and has continued for 66 years. The Musical while it’s in town on April 18th and 19th and Flashdance: The Musical will be here shortly after from May 6th-11th. Don’t forget to check out GE Presents: The Mystery of the Albany Mummies before its last day on June 8th!